If you think all trolls are scary, then that’s because you haven’t met Electric Sam. He’s the friendliest one you’ll ever meet and the kindest one too, because he wants to pay you for your time at Troll Wood.Sam runs a casino deep in Troll Wood where he lives with his wife Sandra and Maggie. 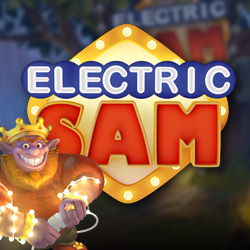 Electric Sam is by ELK Studios. It’s a 5 reel, 243 ways to win video slot that comes with quite a few bonus features like free spins sticky wilds, multipliers, imploding symbols and more. Stakes start at 20p to £100 per spin. ELK Studios is a Swedish based company that was established in 2012 which is currently working hard to be a master at developing mobile casino games. Their philosophy is tocreate quality games in small doses, instead ofa large quantity of poor quality games. So far they have released a handful of games, but they’re all very enjoyable slots that are slowly getting more and more popular. ELK uses the latest technology and applies advanced mathematical models in the creation of their games. However, it’s that human touch aspect that they've added to their games that gives them a mass appeal. The Electric Sam slot will have you intrigued right from the beginning of the game. First off you’ll see Sam there with his big smile that just invites you in. All the action is set against a forest backdrop and everything is bright in these woods- there’s so many fairy lights that make the place look inviting and beautiful. Sam’s casino has classic symbols like melons, lemons, plums, cherries, and 7s which all appear in the style of neon lights. Joining these is the family trio– Electric Sam, Sandra and Maggie. 5 Samshave a payout of 300x your line bet. The fruit symbols pay the lowest value of up to 40 coins. The 7’s pay 80 coins. Wild symbols- Electric Sam is the wild symbol. He can replace any of the other symbols to form wins. Scatter symbol- The bell symbol is the scatter. It can activate free spins. Collect 3 bells and you activate 5 free spins, 4 give you 10 and 5 give you up to 15. Free spins- The game gets exciting when this bonus round begins. 3 extra bonuses are available to add a little zest to the feature. Land 3 or more Sam symbols and Sam goes electric turning a random symbol on the reels into a sticky wild.3 or more Sandra symbolshave a prize for you- a multiplier that’s going to be applied to your wins. Land 3 or more Maggie symbols and she will activate a series of imploding symbols which turn any line into a winning combination. Betting strategies- Electric Sam slot has 3 unique betting strategies Booster, Leveller and Jumper which automatically raise your stake whenever you’re on a losing or winning streak. You can set your own betting strategy at any time. Electric Sam sound and visuals are well done. The cartoon graphics are clear and the design is top-notch. The features and concept are creative, but this is a slightly low variance slot. Really huge wins are hard to come by.